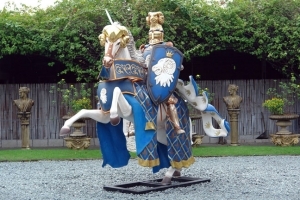 Our Blue Knight riding his White Charger is a spectacular large centre-piece for a medieval display. 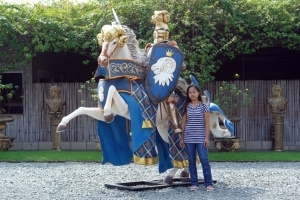 This life-size combination of horse and rider model is sure to attract attention. 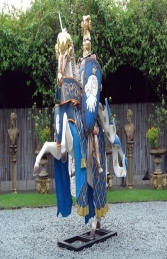 Our Life-size Knight on Horse holds a jousting stick out in front of him and his shield hangs on the side of his horse's flank. 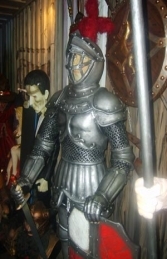 The detail of the armour is very impressive along with his full ceremonial dress ready to impress his lady. 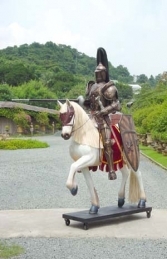 This model would make an ideal pairing with our Dragon model (JR-080081), or with our Knight on Horse (JR-1987).